Whether or not that’s true, Hollywood — located, after all, in the City of Stars — finds the metaphor alluring. The latest version of A Star Is Born, directed by and starring Bradley Cooper alongside Stefani Germanotta (a.k.a. Lady Gaga), is now the fourth movie to bear both the title and a plot arc about one star rising while another dims. The first one came out in 1937, focusing on an aspiring starlet (played by Janet Gaynor) and an established actor (Fredric March) whose alcoholism is causing his own career to plummet. 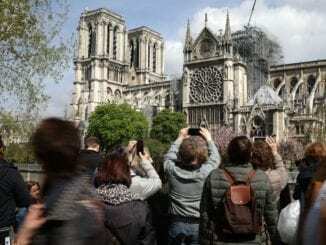 The film was remade in 1954 with Judy Garland and James Mason, and then again in 1976, this time set in the world of music and starring Barbra Streisand and Kris Kristofferson. Differing cinematic sensibilities due to the era aside, the concept remains the same: A man who’s seen it all in show business and who’s been driven to addiction by its hollowness encounters a talented, refreshingly authentic woman (younger, to varying degrees) and falls in love with her almost on sight, then introduces her to the business he’s already conquered. They marry just as the industry is beginning to take note of her. Though they mutually support one another, his love for her can’t overcome his own depression. 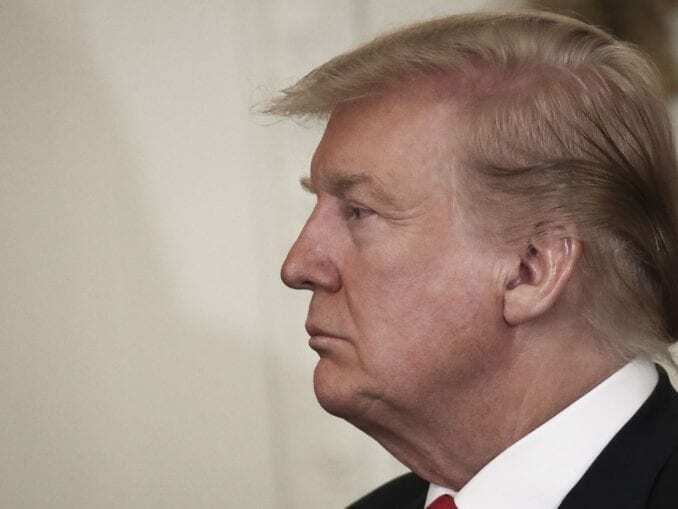 The celebrity on which he’s coasted won’t save him forever. And meanwhile, he’s dragging down the woman he loves. Some people have said that every generation makes its own A Star Is Born (though I’m personally glad we skipped whatever “sell-out” fable the ’90s would have served up). And this one contains homages aplenty to the earlier films, particularly the 1976 version. By now, you can’t just watch A Star Is Born; any new iteration of the story begs to be seen through the lens of not just its predecessors, but also the world into which its particular star will be born. Bradley Cooper — for whom the 2018 film, his directorial debut, is a passion project in every sense — seems to understand that intuitively. His Star Is Born follows the same contours as earlier versions, but feels anchored in 2018, particularly because the extra-cinematic work of his leading lady — unapologetic pop provocateur Lady Gaga — lends extra meaning to the film. And it’s also the first of its breed to focus predominately on the love story between the rising and falling stars, equal partners in the relationship who nonetheless find their deep connection altered and shaped by the ways that success in creative work can keep shifting the landscape under two lovers’ feet. The movie works best, above all, as a melodrama about the limits and possibilities of love, and how love can make us into the best and worst versions of ourselves in the very same moment. Laced with instantly memorable songs and — clichés be damned — stellar performances, 2018’s A Star Is Born is the kind of movie that tries to harness all of its cinematic possibility to make your heart burst. And it more or less succeeds. Like its predecessors, A Star Is Born introduces both its stars in media res. The star on the decline — his alcoholism and addiction have long since exceeded the “high functioning” stage — is Jackson Maine (Bradley Cooper), the character called “Norman” Maine in earlier versions. Here he’s a blues-rock megastar, a wounded man with a soft heart whom Cooper plays with credibly bruised gruffness. Following a gig that he drunkenly pulls off just fine — we’re meant to know this is a nightly occurrence — he asks his driver to stop at a random bar, which turns out to be hosting its weekly drag night. He sticks around. And, as luck (or fate) would have it, Ally (Gaga) is performing. A waitress at a much fancier joint by day, she’s a singer by night, and because she used to work at the bar, its proprietors let her have an act in the drag show. She sings La Vie en Rose and brings the house down. In the time it takes to sing that one well-worn song, she wins Jack’s artistic respect and, it is clear, his heart. 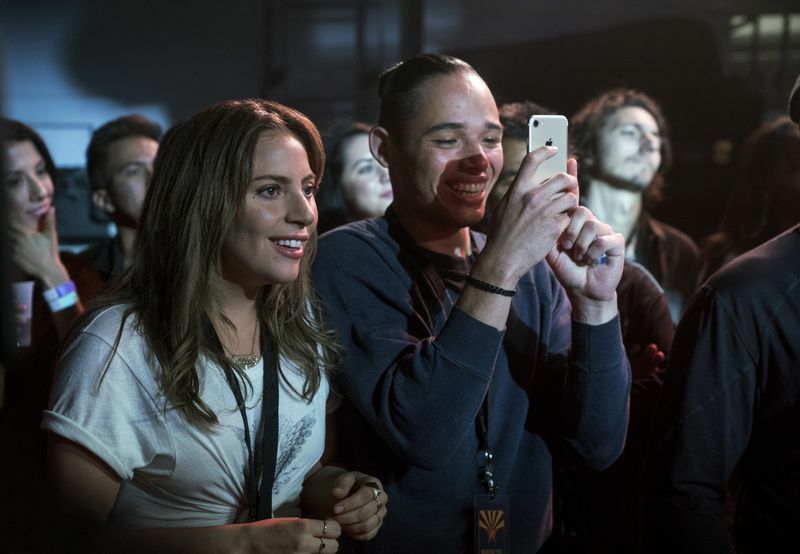 Clay Enos / Warner Bros.
Lady Gaga and Anthony Ramos in A Star Is Born. From there, the story is familiar, though with some 2018 twists. Ally writes her own music, but doesn’t usually sing it in public; Jack convinces her she ought to, and then drags her out onstage to do so. (The song they perform, “Shallow,” which Ally is meant to have written, is almost certainly a shoo-in for Best Original Song at the 2019 Oscars.) They work in different genres — his sound is blues-rock with a hint of country; hers is pop — but they complement one another perfectly. This is Ally’s story as much as Jack’s — she’s the star in the title, after all. 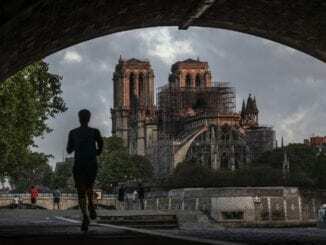 He lights the spark beneath her, but she already contains everything needed to burst into flame, including a healthy skepticism about losing control of her own image in an image-based business. Though she suffers a few growing pains in the form of lousy pop songs, she is more than capable of finding her way. 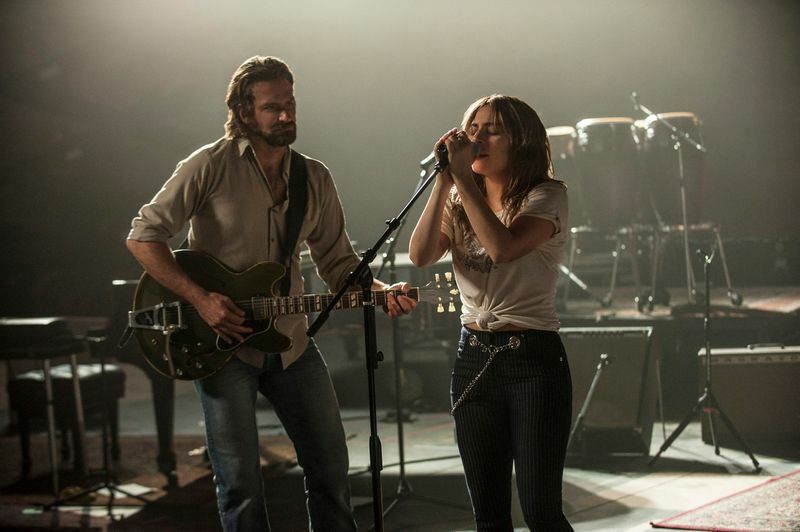 A Star Is Born’s songs were written and produced by a stable of talented artists all over the genre map: Jason Isbell, Lukas Nelson, Mark Ronson, Diane Warren, Anthony Rossomando, and others, as well as Cooper himself and, of course, Lady Gaga, who brought in a number of her frequent collaborators to write Ally’s songs. 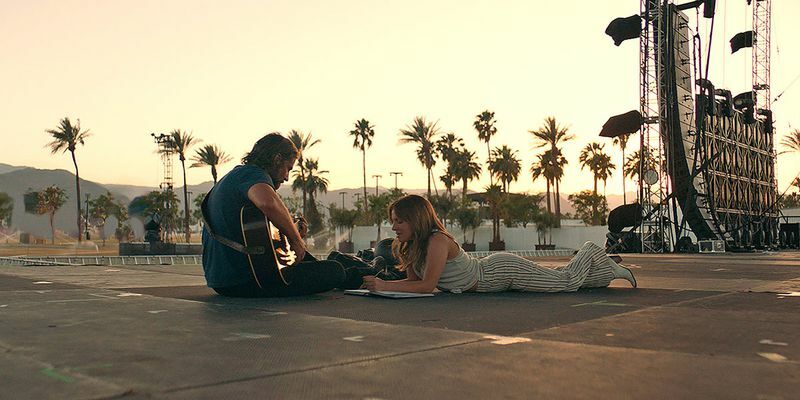 And while it’s not a perfect film — though the first hour just may be — A Star Is Born boasts more than enough passion to make up for some of its narrative hiccups. It swings from intimate drama to concert film and back again with a limpid pace and fluidity. And when it deviates from its predecessors on certain plot points, those choices feel both modern and perfectly natural. It’s hard to imagine watching the film and not being moved. A Star Is Born has only a moderate interest in the actual music business, however — a fact that will doubtless raise the hackles of some viewers positioned closer to the industry. Whereas some of the earlier versions of A Star Is Born have dwelt on how stars are actually created, and what makes them fade, this one is more interested in what happens between the stars themselves. So this is a musical melodrama, one shot through with heat and light. Cooper, acting his heart out while directing at the same time — it turns out he’s great at both — plays Jack with a low growl, a tribute to the older brother (played by the wonderful Sam Elliott) whom he idolizes. The electricity of their connection — and the fact that their relationship develops into something that can bear the weight of both hardship and success for so long — is, the movie suggests, due at least as much to their mutual respect for one another’s gifts as creators and performers. It would be wrong to say there’s no hint of jealousy. But where envy creeps in, it never becomes about tearing the other person down; theirs is a loving, passionate, complicated link that lets them both create some of their best work, and become their better selves, too. Love can’t conquer everything. Scars run deep. But love is what ultimately allows the jealousy to fade. A Star Is Born is undoubtedly a swirling, highly produced, Hollywood-style melodrama, but it has something to say about the world it’s set in, about what it takes to remain a human in the midst of a celebrity-making machine that would rather package people to conform to its own standards. The message the film sends is that it’s not really about “being authentic”; we stay real because other people see us, and they love us for what they see. 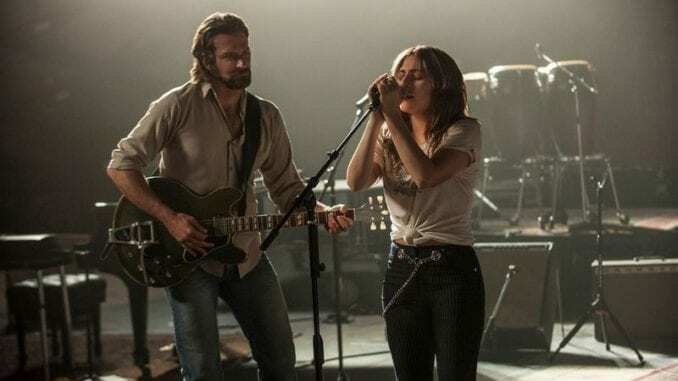 A Star Is Born premiered at the Venice Film Festival, made its North American debut at the Toronto International Film Festival, and will open in theaters on October 5.